Eighteen days ago, WIlliston Boys Hockey (8-7-1) held a two-goal lead heading into the third period against Berkshire. The Wildcats gave up two early goals in the third period and the game ended in a 3-3 tie in overtime. But in the same position heading into the final eighteen on Wednesday, January 28th against Millbrook (8-11-3), the Wildcats got the job done this time pulling out a 4-2 victory. With this win, the Wildcats regained a winning record, something they have not enjoyed since the first game of the season. This was the team’s fourth home win of the year. The team’s top line of JoJo Carbone ’17, Scroggins ’15, and Jack Kelly ’16 produced all four of the team’s goals today. Carbone scored the team’s first two goals in the first and second periods and assisted Scroggins’ goal, the team’s third goal in the second period. With twenty second to play, Kelly scored an open net goal from Williston’s own blue line to seal the win. Sophomore top-lines forward Nick Schofield was out for his third straight game with a knee injury. In Schofield’s absence, the team has experimented with different lines. In the two games, the team’s top line has scored six of the team’s ten goals. While there were no penalties in the first period, the teams went to the box a combined twelve times in the final thirty-six minutes. Williston’s seven penalties gave the Mustangs many scoring opportunities. Millbrook’s second goal was scored on a 5-on-3 power play. The Wildcats’ next game is this Saturday, an away game at Albany Academy. With the team’s game against Gunnery canceled this past Saturday, Williston Boys Hockey (7-7-1) has not played a game since last Wednesday, January 21st. But between tomorrow and February 4th, a span of seven days, the Wildcats will play four games in eight days against teams with a combined 43-23-5 record. Two of these games will be at home, two on the road. Williston’s first opponent is Millbrook (8-10-3) tomorrow, January 28th at 4:30 p.m. The Wildcats will play their first home game since the 16th, hosting Millbrook. Millbrook comes into the game having lost its last four of five games. But the Mustangs did defeat Berkshire 5-3, a team the WIldcats lost to 7-5 ten days ago. With four goals and nineteen assists, sophomore forward Matt Gosiewski (#8) leads Millbrook in points. The Mustangs’ starting goaltender, junior Owen Johansson, has posted in a .897 save percentage in 526 minutes played this season. In January, the Wildcats have lost just two games, won four, and tied one. The team has scored at least five goals in its last four games, scoring six against Worcester and Vermont Academies. Sophomore and top-line forward Nick Schofield is still out with a knee injury he sustained against Winchendon on January 16th. With Schofield’s injury, the team has experimented with a few different line combinations that the Wildcats have adapted to well. This Saturday, January 31st, the Wildcats will travel to New York to take on Albany Academy. After an 8-18-3 record in 2013-14, the 2014-15 Cadets (11-6-2) have been a very different team this season. The team’s biggest win has been a 4-2 victory over Salisbury, one of the top teams in New England. Junior forward Kevin O’Neil (#22) lead the team in assists (21) and points (31). Follow the team’s Twitter feed (@WillistonHockey) for in in game updates. In New England prep school hockey, a win is a win. The Wildcats’ trip to Saxtons River, VT to defeat Vermont Academy 6-2 on Wednesday, January 21 was certainly a success. But this was by no means a flawless performance. In many of Williston’s games this year, the Wildcats have played very well for much of each game with occasional lackluster moments. Against Vermont, though, the Wildcats played sloppily, particularly in the defensive zone. One of the team’s biggest issues was that it often left the front of the net unguarded while the puck was in the corners. This allowed Vermont players to get open shots off passes from their teammates who had the puck behind the net. Luckily for the Wildcats, Vermont didn’t handle many of these passes and capitalized on few of its other scoring opportunities. Williston did well in that it took advantage of many of its scoring chances. The Wildcats scored two goals in each period while Vermont scored its two goals within the final fourteen minutes. In the second period, senior forward Jack Gethings scored his eighth and ninth goals of the year to put the Wildcats up 4-0. At 6-7-1, Williston Boys Hockey is just past the halfpoint of the 2014-15 season. As they have shown in most games this season, when at their best, the Wildcats are capable of competing with the top teams in New England. Williston, however, has defeated itself. Most recently against Berkshire this past Saturday, Williston’s numerous turnovers gave a very skilled and physical team the edge it needed to win by two goals. The team’s five goals demonstrated its potential, but proved insufficient. While the toughest part of the Wildcats’ schedule may have happened in the first half of the season, it doesn’t get much easier for the end of January, and the final month of the season, February. This upcoming week, the Wildcats will face two teams on the road with a combined 24-9-3 record. Up first on Wednesday, January 21st, is Vermont Academy (11-5-3) at 4 p.m. Vermont has lost just two of its last eight games. Vermont has lost twice to Kimball Union by four goals. Williston’s one game against KUA this season was a 5-3 loss. With three players with at least 33 points this season, and six with at least 15, Vermont has two very strong lines. Juniro forward Houston Wilson (#9) leads Vermont with 18 goals and 21 assists. Then, this Saturday, Williston will meet Gunnery (13-4-0) for the second time this season. One of the best teams the Wildcats have faced this season, the Highlanders defeated Williston 9-5 at home on December 13th. Since December 19th, Gunnery has won ten of eleven games. In USHR‘s most recent Prep Poll released on January 19th, the Highlanders were ranked at number five. According to that poll, Gunnery scores, on average, 3.62 goals per game, while conceding an average of just 2.19. Gunnery is a very balanced team. Williston Boys Hockey on the Williston pond last week. Photo courtesy of Kenzie Possee ’15 via Williston Flickr. 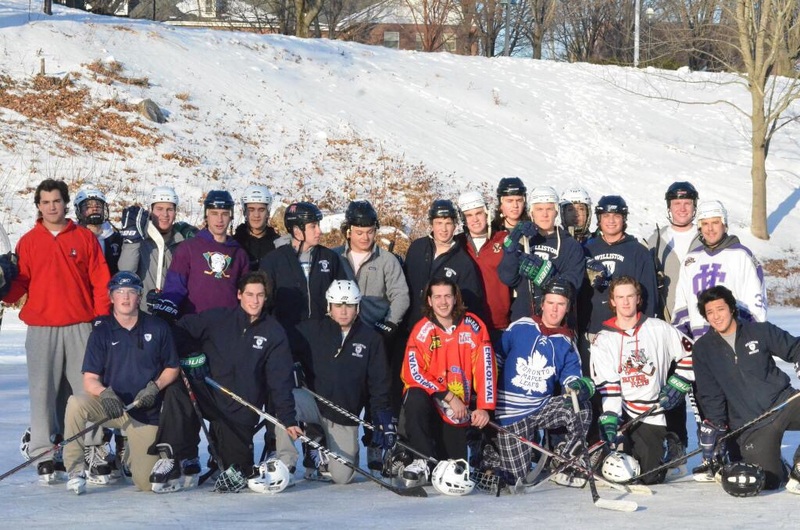 Last week, the team took advantage of the cold temperatures and enjoyed Williston’s former rink, the Williston pond. A section of the frozen surface was plowed by Williston’s Physical Plant. As pictured, the Wildcats sported jerseys of their favorite professional teams and other teams they have played for. Williston Head Coach Derek Cunha wore his uniform from his playing days at College of the Holy Cross. In 2001-02, Mr. Cunha played in 26 games posting a .901 save percentage and a 14-9-3 record. The Wildcats displayed in each period against Berkshire (9-5-1) on Saturday, January 17th, that they were capabale of competing and scoring against the Bears. However, numerous turnovers and a lack of protection in front of its own net prevented Williston Boys Hockey (6-7-1) from staying in this game. Down by three goals in the third period, Williston scored two goals to cut the Bears’ lead to one. With 1:29 to play, Williston turned the puck over to Berkshire in the defensive zone and the Bears eventually knocked the puck into the net off a rebound to take a 7-5 lead. This week, the WIldcats captured four of a possible six points to move up in the standings. With this loss, the Wildcats moved to one game below .500. Last Saturday, the Wildcats tied the Bears 3-3 in overtime at Williston. Berkshire’s ice surface is Olympic sized; the rink is fifteen feet wider than an NHL rink, the size that most prep schools have. The Wildcats were without first-line forward Nick Schofield who injured his knee on Friday night against Winchendon. This meant that most members of the team were playing on different lines than usual. Senior forward and captain Tyler Scroggins had a goal and two assists in this game. Scroggins has recorded ten points since the team’s last game against Berkshire. In his second year on the team, Scroggins leads the team with 19 assists and 24 points. This upcoming week, the Wildcats have two away games against Vermont Academy and Gunnery. The WIldcats’ first game against Gunnery this season, a game marred by penalties, resulted in a 9-5 home loss for the Wildcats. 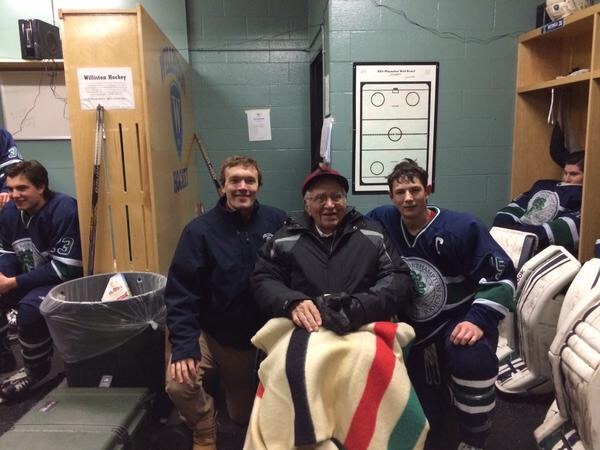 With the game tied at two to start the third period against Winchendon (4-10-2) on Friday night, Williston Boys Hockey (6-6-1) took control of the game, scoring three goals in the first five minutes of the period. With this win the Wildcats bring their record back to .500. This is significant considering that Williston had a 1-5 record on December 19th. Since that date, the Wildcats have defeated Northwood Junior, Winchendon, St. Sebastian’s, and Worcester, and Winchendon again today. The Wildcats got some of their best scoring opportunities in the first period, but they were unable to get their sticks on the puck when it was in front of WInchendon’s net. Sophomore and first-line forward Nick Schofield left the game during the first period after getting hit in the neutral zone and did not return. He was on crutches after the game with an apparent knee injury. Senior forward and team captain Rourke Ferguson returned today after sitting out two games with an injury. Both teams scored two goals in the second period, with Winchendon getting on the board first. After junior forward Jack Kelly scored Williston’s first goal, senior forward Brandon Bork added the second on the power play. Just 2:15 into the final eighteen minutes, junior forward Jack Kelly scored his second goal of the game to give the Wildcats the lead. Just over a minute later, Bork scored his second of the game on the power play to give the Wildcats a two-goal lead. And 5:02 into the third, senior forward Jack Gethings hit the top corner of the net to give the Wildcats a 5-2 lead and put the game out of reach for the Wapitis. Senior forward and team captain Tyler Scroggins recorded four points tonight, assists on the team’s first four goals. Junior goaltender Shane Mason was very solid in net for the Wildcats stopping 28 of 30 (.933) shots. Tomorrow, Saturday, January, 17th, the Wildcats will take on the Berkshire Bears on the road. This game will be a rematch of last Saturday’s game between these two teams which ended in a tie. On Wednesday, Berkshire defeated Northfield-Mt. Hermon 5-3. The game is scheduled to start at 2:30 p.m.
Stay tuned to the team’s Twitter feed @WillistonHockey for continuous game updates tomorrow. Behind two goals from senior Jared Karas and three power play goals, Williston Boys Hockey (5-6-1) defeated Worcester Academy (3-7) on Wednesday, January 14th. This was the Wildcats’ first shutout of the season with junior Shane Mason stopping all shots in the first two periods (14) and senior Elie Small played the third period stopping all seven shots. After a sluggish start, Williston scored its first goal 4:31 into the game and added a second three minutes later. The team’s final three goals were scored on the power play. While the Wildcats took the only three penalties in the first period, Worcester went to the box six times in the final two minutes. Scoring three power play goals and giving up none is a good sign. The highlight of Wednesday afternoon happened in the locker room between the first and second periods. Ninety-eight year old 1936 Williston Hockey captain visited the 2014-15 team accompanied by Williston Head of School, Mr. Robert Hill. 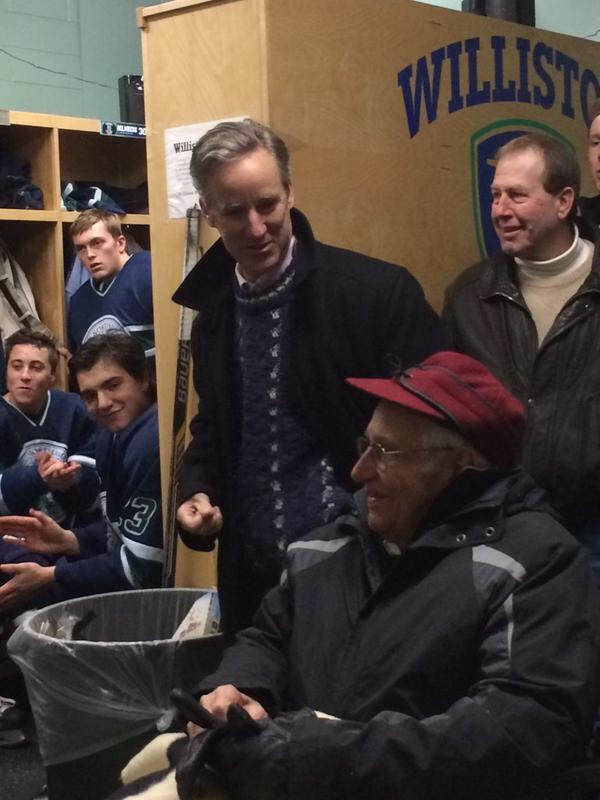 Mr. Craig Campbell’s visit put Williston Hockey program history into perspective for members of the team this season. Mr. Campbell between 2014-15 Williston Boys Hockey captains. Left side: Rourke Ferguson ’15. Right side: Tyler Scroggins ’15. Two days from now, on Friday the 16th, the Wildcats will take on Winchendon. The teams’ first matchup this season resulted in a 4-3 Williston win. Up by two goals to begin the third period against Berkshire (7-5-1) on Saturday, January 10, Williston Hockey (4-6-1) conceded two quick goals and the game ended in an overtime tie. While this game felt like a missed opportunity for the team, it was a stride in the right direction for the WIldcats against a very solid Berkshire team. After a poor start, in which the Wildcats had a 1-5 record, the team is working to get back on track to be in playoff contention. Before the game, though, the Willdcats will take on Worcester Academy tomorrow, Wednesday, January 14, at 4:30 p.m., and Winchendon on Friday, January 16, both home games. These two teams have a combined 7-14-2 record. Williston has faced Winchendon once before this season. That game, a part of the St. Seb’s Holiday Tournament, was played on December 21st, a 4-3 win for the Wildcats, which broke the team’s five game losing skid. Follow the team’s Twitter feed, @WillistonHockey, for news and in-game updates. For much of this game, Williston Boys Hockey (4-6-1) played well enough to beat the top New England Prep Hockey teams. But periodic lapses against Berkshire (7-5-1) gave the Bears enough chances to stage a two-goal comeback. Like many games this season, the Wildcats had an unproductive start to this game, which included numerous turnovers. A bad bounce led to Berkshire getting on the board first 3:49 into the game. From about the midway point of the first period until near the end of the second, Williston played some of the best hockey it has this season. With just under four minutes to play in the first period, senior forward Jared Karas scored his third goal of the year to tie the game. Typically on Williston’s top line, Karas has dealt with a few nagging injuries, so Williston Coach Derek Cunha decided to switch up the lines for today’s game. The Wildcats dominated much of the second period, outshooting the Bears 15 to 12. Getting pucks to the net has been an issue for the Wildcats in recent games, but not in this period. Just 2:36 into the second, junior defenseman RJ Guardia took a shot from behind the blue line which the Berkshire goaltender was unable to handle. In his second year on the team, this was Guardia’s first goal as a Wildcat. Six minutes later, on the power play, senior forward and co-team captain Tyler Scroggins extended Williston’s lead to 3-1. In the third period, the Wildcats were unable to sustain the momentum they had created in the second period. Their play in this part of the game was similar to the team’s start to the game. The Bears scored just eleven seconds into the game, and tied the game with 14 minutes to play. The rest of the period was a back and forth game with neither team creating good scoring chances. Both teams were unable to control the puck in the five-minute, sudden death overtime. The Wildcats got their best chances in the final seconds, but Berkshire’s goalie kept the game at a tie. The Wildcats had 34 shots in this game, but just six in the first period, then 15 in the second, 13 in the third and overtime. Junior goalie Shane Mason made his tenth start in net for Williston, stopping 35 of 38 (.921%) shots. Throughout the game, Mason prevented Berkshire from taken adavantage of prime scoring opportunities. The Wildcats were without senior co-team captain forward Rourke Ferguson, and senior forward Quinn Griffin. Against Berkshire, junior forward Jack Kelly moved up to the team’s top line. Generally a defenseman, junior Tiger Lindsay joined the team’s third forward line. Tiger joined his older brother, senior Justin Lindsay, on this line. This upcoming week is a big one for the Wildcats as they face three opponents, two at home. On Wednesday, Williston will face Worcester Academy (3-5) at home. Two days later the Wildcats will host Winchendon (4-8-2). The next day, Saturday, the team will make the long trip to try to avenge today’s third period when they take on Berkshire in Sheffield, Mass. A preview of this week will be posted on Tuesday. With a 4-6 record to start 2015, WIlliston Boys Hockey has enough time to fix mistakes made in 2014. From December 3rd to the 19th, the Wildcats lost five consecutive games. However, four of those losses were gainst top ten teams according to United States Hockey Report’s January 5th Prep Hockey Poll. WIlliston’s fifth loss was against St. Andrew’s College, the top team in Midwest Prep Hockey, in the first round of the St. Sebastian’s Holiday Tournament. After that loss on December 19th, the WIldcats won three consecutive games against Northwood Junior, Winchendon, and St. Sebastian’s over winter break. The team’s most recent game on January 3rd was a 4-3 loss to Nobles, ranked as the number eight team in the aforementioned poll. In the team’s first ten games this season, there were two main factors that contributed to the team’s struggles. The first was the team’s tendency to not play as well in the first period as in the final thirty-six minutes. In each of Williston’s six losses this year, the Wildcats have conceded the first goal. In five of those losses, Williston was down by at least one goal at the end of the first period. The second area of concern for the team has been the number of minutes it spends in the penalty box each game. The Wildcats have averaged just under five penalties per game, which is about ten minutes on the penalty kill per game (penalty information was not posted on USHR for the team’s game against Gunnery). Against Nobles, both teams were very disciplined with Williston going to the box once for the only penalty of the game. Penalties were especially a problem earlier in the season when the Wildcats were still figuring out how to play shorthanded. Williston Head Coach Derek Cunha stated earlier this week that the the team’s penalty kill and power play has seen improvement in recent games. “I think that special teams has gotten a lot better over the two tournaments [during winter break]. I think our penalty kill has gotten better,” Cunha said. On Saturday, December 10th, the Wildcats will host their fourth game of the season when they take on the Berkshire Bears (7-5) at 3:15 p.m. Williston and Berkshire have played similar schedules this season, with many mutual opponents. Like the WIldcats, the Bears have defeated Northwood, Canterbury, and St. Sebastian’s. Both teams have lost to Gunnery and Nobles. Leading Berkshire in goals (8) in sophomore forward Matt Koopman (#10) (8 goals). Senior forward Zach Hale (15) leads the Bears in assists (9) and points (14). Game updates will be available tomorrow via the team’s Twitter feed (@WillistonHockey).